Happy Fathers Day is something I haven't said to my Dad in decades. 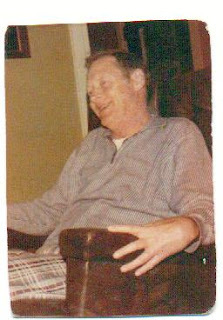 Daddy was tall, blond, kind, handsome, he was my gentle giant as I grew up. I have beautiful memories, they may be dusty but they are still alive in my mind. I remember sitting on the hanging porch swing when I was little, we lived in Connecticut, there would be thunder and lightening all around and we would sit and rock and discuss the weightier subjects of life, at least in the life of a five year old. During my early years I was a swimmer on the local YMCA swim team. A bunch of us little girls would pack in our parents cars and off we would go to a neighboring town for a day of swimming. I remember one meet in particular I really wanted a ribbon and was so close but just missed out. When I got to the bleachers I was in tears. Daddy took my hands and looked into my eyes and said they may have won the ribbon but you were the most graceful swimmer in the pool today, I think I was 10. There was quite a large group of us when we were in high school we did everything together. Sleep overs were a big event and it seems like there was a big sleep over at one of the girls homes each month. I remember one time, I think it was the first big sleep over we had at our home Daddy agreed to prepare his specialty, sliced hot dogs in pancakes, for breakfast, keep in mind we had 20 little girls all over the house. When Dad came down the stairs in the morning he called me, "Teri, where are you, there are so many bodies everywhere I don't know where to step, come help me get to the kitchen." We all laughed at poor Mr. Baker. My senior year I was voted to the Homecoming Court and we were at the football game for the big crowning. I was very nervous and as we rode out to the center of the field they called the names of the court and last would be the queen. As they called each girls name I was looking at my Dad on the sidelines he was smiling when the last name they called was mine. The lovely stories go on and on until a day in January when Daddy lost his battle from the affects of rheumatic fever. During all the milestones and fun times of my young life his presence was profoundly felt. Leonard R. Baker, Jr., my Dad, was the first great love of my life. His lessons were always gentle and sweet, I carry them today. Thirty three years later I still love this kind man, and will honor him today. Sending my gratitude to all the dads, husbands, brothers, sons, and friends celebrating the care and understanding you have offered us, your students as we apply them to our journey of life.